Old Testament Jericho is located at Tel es-Sultan near a very powerful spring. It is 6 miles west of the Jordan River and 10 miles north-northwest of the north end of the Dead Sea. The tel is about 10 acres in size, which implies about 1,500 people lived on the site of the tel. 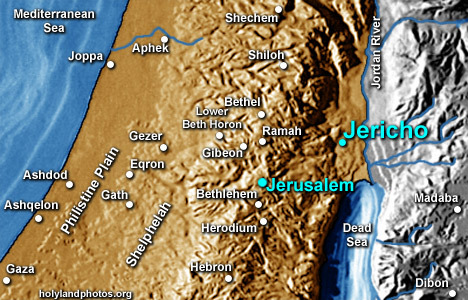 It is mentioned 56 times in the Old Testament (Hebrew Bible) and is featured in Joshua's conquest of the Land of Canaan. It has been excavated by numerous persons including John Garstang and Kathleen Kenyon. To view images of New Testament Jericho Click Here.